Change of reputation. New war. 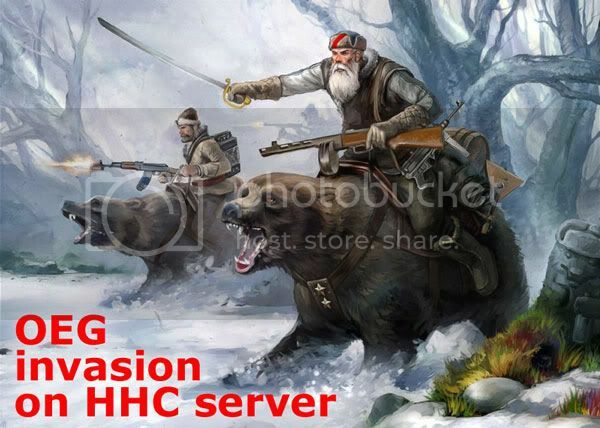 In connection with calm on HHC, OEG has decided to shake a dust from old clans. And declared a war since 21st December to clans uSF and R_W. Wir werden die Tage das Gespräch mit dem -]uSF[- Kommando suchen um diese neue Situation zu besprechen. Die angespannte Situation in Sirius spitzt sich zu. Wünsche beiden Parteien viel glück. 1. )We noticed your declaration of war as an attack on our Omicron-Pirate-NAP. All Reputation to you and yours Memberpilots will be changed to deep red. After we will regenerate our Membershipment soon, you wont be trying to clame this Territory anymore. As long as you keep staying in Gamma, we will notice your declaration as Ignored. As soon as you enter Theta , Beta, Sigma-19, Alpha or Kusari Space, you will be shot without any warning. You are not allowed to enter these Systems until you pay us a NAP-Fixcost of 35 Million Credits to get your Neutral Status back. 2. )The OIA Clan has to choose one side, remember that we are still Friendly Status since 2004. If the OIA decides for the other side, we will have to cancel also this NAP. "Hier ist alles drin was nirgendwo anders genommen wurde"
hey! ich dachte frauen an die macht oder wie war das letzte nacht?!?! Today at night, in system Omicron Gamma at the planet Crete has been noticed the Nomad ships. We ask all to keep calmness, OEG patrols make active searches for liquidation of threat. There is a basis to assume, that it is a harbinger of invasion. 1. Wir befinden uns im Krieg . Denke dass in Ihrer Lage irgendwas zu fordern oder irgendwelche Drohungen zu setzen ist einfach Lächerlich . Mit Respekt euer liber Hans Gudensolder. After your attack OEG ships, we declare war. Within one week we will kill all your fighters\transports. after one week, we will attack only fighters. if you kill our transports, we will follow you always (FDG know how it interesting lol). Last night, during performance of the most complicated trading operations connected with clan-missions, small defenceless trading ship OEG has undergone to treacherous attack very heavy fighters-] uSF [-Kermit and-] uJR [-Destructer. Only by a lucky chance our trading ship has avoided death, and has reached base with 1 % of a hull. In this connection, OEG removes an interdiction on destruction of the trading ships-] uSF [-. Hunters OEG go to a track of war. One week left, now we finish hunting your transports in all Sirius, and will kill your traders only in Omicron-systems. Today in night, OEG Transport was attacked [Händler-Allianz]Ice,[Händler-Allianz]Elite and Silwith. They could not kill our trading ship, but in this connection, OEG removes an interdiction on destruction of the trading ships [Händler-Allianz]. Now we will kill all [Händler-Allianz] traders whom we shall see. This page has been viewed 227000030 times.